Extend the life of your vehicle - old or new - by shielding it from the elements with a heavy-duty car or truck cover from Classic Accessories. With the PolyPro™, PolyPro III™, or deluxe 4-ply fabric covers, your prized possession will get the ultimate protection against dirt, scratches, pollution, and UV damage. Deluxe Four Layer Plus 4 fabric provides maximum water repellency and resistance, yet allows moisture to vent out. Triple layer PolyPro III fabric provides all-season protection against dirt, pollution and bad weather. PolyPro fabric protects cars against dirt, scratches, pollution and sun damage. Triple layer PolyPro III fabric provides heavy-duty protection against dirt, pollution and bad weather. PolyPro fabric protects SUVs and pickups against dirt, scratches, pollution and sun damage. Keeps snow and ice off the winshield and helps protect the interior against harmful UV rays. Car covers are an easy and effective method for protecting your vehicle against scratches, paint peeling, UV damage, discoloration and more. Our custom car covers are fit for almost any make and model. 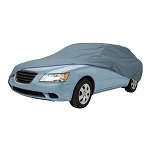 We carry covers for compact cars, sedans and SUVs. Don’t fret if you have a pickup truck, we have a line of truck covers as well. These synthetically made, waterproof car covers are designed to keep rain and snow from reaching your car and allow moisture and condensation to escape. This ensures that your vehicle is not at risk for any adverse effects the elements may cause. Don’t hesitate, order your cover today to extend the life of your vehicle and keep it looking as good as the first day you got it. These products are heavy duty and made with portability in mind so you can protect your car even when travelling. Remember, we offer free shipping on orders over $99 and have exceptional customer service for any questions or concerns related to our products.